4 Bedroom Detached House For Sale in Sheffield for £500,000. View the virtual tour of this stunning, four bedroom detached property with simply fabulous views. 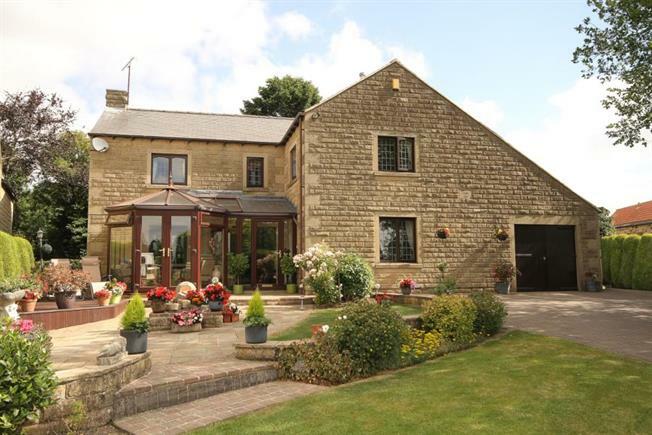 It is situated in the beautiful village of Middle Handley which has easy access to both Sheffield and Chesterfield. The Entrance leads into the porch which in turn leads into the hallway with a door to your left taking you into the lounge which has a feature fireplace. Access from the lounge is into the beautifully positioned conservatory with views over the front lawn and driveway. Off the hallway is the spacious modern fitted kitchen/dining room, a particular feature of this room being the stunning glass atrium roof. Useful storage is provide by the separate utility room which has a range of wall and base units, plumbing for an automatic washing machine and wash hand basin. Additional space is provided on the ground floor by the spacious sitting room with feature fireplace and window with views to the front of the property. To the first floor is the master bedroom with fitted wardrobes and en-suite, featuring a wash hand basin, low flush toilet and shower. The second double bedroom has fitted wardrobes and a large storage cupboard which could easily be converted into an en-suite. There are two further good size bedrooms. Also to the first floor is the generous family bathroom with seperate shower, bath , wash hand basin and low flush toilet. The property is approached by a sweeping driveway opening up to further lawned garden, patio and decking areas. There is a large garage and additional side storage area. Viewing the property is essential to appreciate such an impressive property and its surroundings.